This book sold out rapidly – there was a great interest then (and there is still) in Celan’s work. The publishers were grudging about permissions, insisted the edition should be confined to Ireland, and as a consequence a second edition was not pursued. Peter Jankowsky and I subsequently did translations of a further ten poems which were published in Krino and the large volume that anthologised that magazine. For more information on Peter Jankowsky see the links to Easter Snow and the TV drama Caught in a Free State. Paul Celan, regarded as one of the great poets of the German language, thought of his poems as stones. When he drowned himself in the Seine in 1970, his pockets were full of stones. His later poetry is akin to stones washed clean by the remorseless flow of water. His style, as the introduction to PAUL CELAN: 65 POEMS points out, “becomes increasingly lapidary, avoiding what he called the “thyme carpet” of language. Yet, to stretch the metaphor, the water’s mineral traces cling to the stone, and build up as time passes. In several of the poems here, one has almost to stop thinking to let the meaning come through of its own accord – even when it seems most obvious. of the wound-mark in the air. In a sense, this is only difficult in its simplicity. Celan’s poetry, more than any other, requires a suspension of expectations, an ability to meditate on the purity of its language. In Jankowsky and Lynch, Celan would seem to have ideal translators: the precision of Jankowsky’s German coupled with Lynch’s sense of poetic power and correctness. It is interesting to compare their translation of ‘Matiere de Bretagne’ – one of the few poems from this volume translated before – with that by Michael Hamburger in the ‘Selected Poems’ (Penguin 1972). 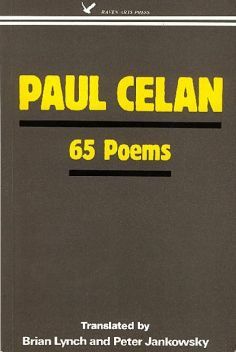 That they have succeeded in doing justice to Celan in these 65 poems I have no doubt. A pure poetic spirit and sense of precision sing out from them. It is a very exciting book. – Philip Casey, The Sunday Press, 1985.